Back in the day, building a Website for yourself or your small business was a huge undertaking. You had to buy and learn new software, figure out how to pull together images and other assets, not to mention settling on a domain name and hosting plan. And you still had to actually run your business. Template-driven site builders seek to remove much of that stress from small businesses who — let’s face it — need a Web presence more than ever. But not all online Web builders are created equal. In fact, some are so time-consuming and overwhelming in complexity and options, that many small businesses give up. SimplyBuilt, as its name conveys, is an easy-to-use site builder which offers ready-to-use templates, Web hosting, domain names, and responsive sites that can be viewed on every device. It also offers services like photo management, search engine optimization, maps, widgets, contact forms, analytics and more. Best of all, if you need help, there’s an actual person present for the assist. We asked John Kakoulides Hunter, SimplyBuilt’s co-founder, to give us the lowdown about his company. 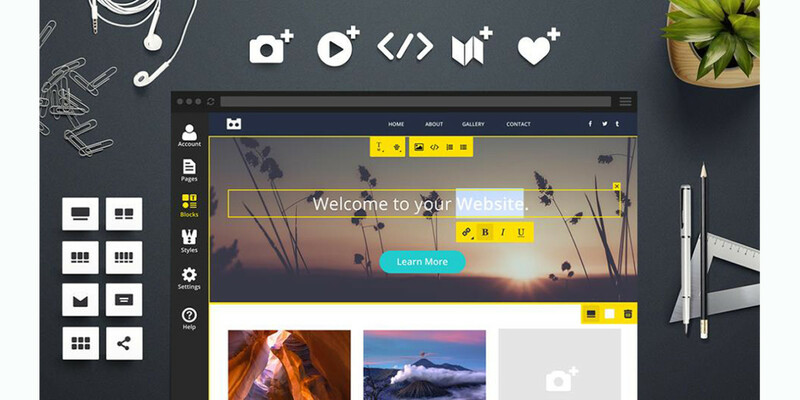 SimplyBuilt is an all-in-one solution for building and hosting a Website. Our mission is to help small business owners focus on running their business by providing a productive and easy to learn a Website building platform. Our parent company, Pushagency.io, was forced to turn down a lot of opportunities to work with small business customers because budgets were — understandably — too small. We developed SimplyBuilt to capture small business customers instead of referring them to other Website builders and competitors. 3. Who’s your biggest rival and why are you better? The company we are most compared to is Squarespace. We hands-down beat them in ease of use. Squarespace has a steep learning curve that turns a lot of people off, while our Website builder and hosting is focused around speed and productivity. Our customer support is also second to none. The company Tee fits all. Get rich is more important in the short term because we are a self-funded company with no investors. Changing the world is more important in the long term. Earnings from SimplyBuilt will be reinvested into other products and services that will serve the small business community and help them become successful. One of our engineers was born in Connecticut, lives in China, works at night, and sleeps during the day — all by choice.